Work Ethic Camp is located in McCook Nebraska. It is a program that lasts no longer than 180 days and addresses an individual inmates personal rehabilitation needs. It is a transition facility that helps prepare inmates who are preparing to be released onto probation, parole, or community custody. Currently this facility can house 200 adult males. 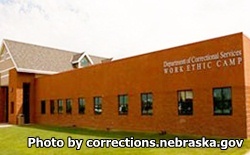 Work Ethic Camp offers inmates programs similar to larger correctional facilities, including educational programs to earn a GED and adult basic education. Parenting courses, vocational classes, anger management, victim impact, and work assignments are just some of the programs offered to inmates at the Work Ethic Camp. Visitors must be approved prior to visiting an inmate. Visitors are allowed to visit on only one day every week, and can attend both the morning and afternoon session for that day. The visiting hours for the Work Ethic Camp are Saturdays and Sundays from 8am-11am and from 1pm-4pm.